Quite frequently horse owners find themselves participating at events, only to keep a watching eye on rising temperatures. Generally speaking, the ability to withstand the rigors of 98 degree weather depends on the animals overall physical fitness as well as its level of acclimatization to its surroundings. If the horse is accustomed to the higher temperatures, it will be able to keep its cool better than an animal that has not had to thermo-regulate in this kind of weather. breezes. If there is no natural breeze that your horse can benefit from, you can create your own with the help of a fan. Radiation is another mode of thermoregulation. It refers to the amount of sunshine the animal absorbs. Since it has a large surface-area-to-mass ration, an animal that is kept out in the blazing sunshine will absorb more heat and thus will most likely overheat. 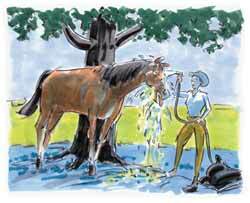 Last but not least is evaporation, such as may be seen in a horse that is sweating or panting. While this is very often seen in hot, dry weather, a high level of humidity will result in an insufficient heat transfer, and thus is ineffective as a vehicle for thermoregulation. Thus, it is not only the air temperature that you will need to keep in mind when exercising your horse, but also the level of humidity. This becomes an extremely important aspect for those horse owners who frequently travel to events and who may not be certain of the weather patterns they will be facing. If you find that you are working your horse in high heat and humidity, you can help the heat transfer to occur by sponging off your horse with cold water whenever your workout routine is completed. Should you choose to use a water hose, be certain to hydrate the large muscle groups sufficiently to normalize respiration rate, and do not use a sweat scraper but instead leave the water in the coat. In addition to the foregoing, take it easy on the feed when working the animal in high humidity weather, since the hindgut produces its own fermentation driven heat. To help your horse to get acclimated to different weather conditions, it is wise to given them about a week. During this time you will be able to lightly increase the exercise until it reaches the intensity you desire. Veterinarians suggest keeping a close eye on the respiration rate of your animal. If it begins panting – which translates to 80 or more breaths per minute - you will need to move it into the shade and take a break from any exercise until the rate of respiration decreases. Additionally, take off the saddle, find or provide a breeze for the animal, and also hose off the horse to help it regain a normal respiration rate of about eight to 10 breaths. Read the next horse health tips article on Post-surgical care.